PHILIPSBURG - The Court of First Instance on Monday has ordered National General Insurance Corporation N.V. NAGICO to pay a US $33.2 million advance to Princess Juliana International Airport (PJIA) for damages incurred during Hurricane Irma which are covered under the airport’s insurance policy. Irma caused severe damage to the airport when it struck on September 6, 2017. The airport is only provisionally opened since then. PJIA had filed an injunction on May 15 as NAGICO had only paid out $25 million in advances, whereas the airport claimed and advance of $72.6 million, and payment of $2.3 million for loss of profit in June, July and August 2018. Under its policy with NAGICO, the airport is covered for material damages to a maximum of $193.3 million, and for loss of profit to a maximum of $29.5 million. 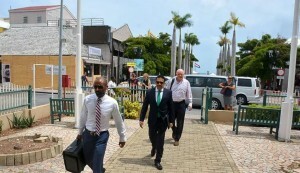 NAGICO disputed the level of damage sustained by the airport, which, it said, was based on estimates and not on real invoices and tenders. Based on a report by Axis York loss adjusters and surveyors, NAGICO calculated damages to the tune of $37 million, including profit loss. The Judge made his decision after parties had failed to reach an agreement through negotiations.